I have spent most of the last month digging deep and developing in PowerQuery and PowerPivot. I must say that I am impressed and there is still a lot more for me to learn. However I am not that much impressed about the documentation available online as there have been some issues I could not find an useful answer to. 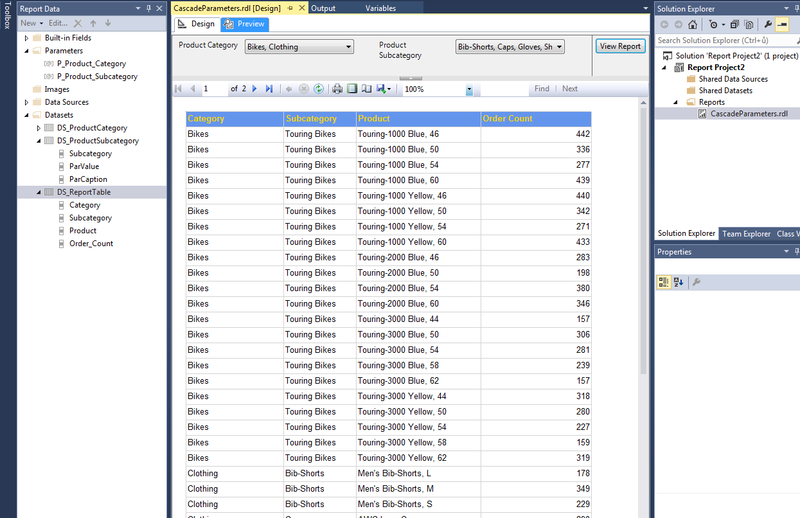 It could easily happen, that if you choose WHERE condition returning no rows, in this case determined by the non-existing Product Category, (or if your user would not have sufficient security rights under the OLAP role ), that the PowerPivot model could become corrupted and loose a relationship related to one of the (not)returned columns. You can rewrite the mentioned Query 1 in a much better way to ensure, that you always get the needed columns no matter how many rows are retrieved. As you can see from the next picture, for Query 1 we have no Customer Name column in the model, for Query 2 we are just fine. I must admit that Customer Name is not a great example since we have the Customer Key returned anyway, but I guess you can see the point where I’m heading here. To stay on the safe side, write bullet-proof MDX queries! Load only the columns you are sure you will need in your data model, no sense loading for example DWH system columns like GUIDs, PKs, System Dates etc..
Track the virtual allocated memory in the Process Explorer application while adding each query. You might find a query loading just a few rows that causes high virtual memory allocation for no obvious reason, and that’s the perfect time to start tuning the query steps one after another. 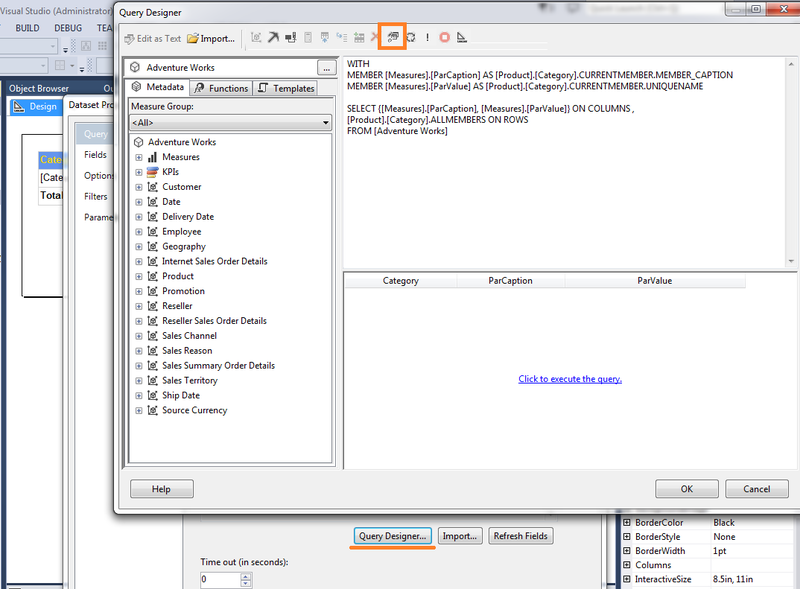 ( Unfortunately I have not found so far a way, how to do some more accurate query performance tracking when the queries are loading data from local Excel file source, however when loading data from different data sources, you have a pretty decent option setting the PowerQuery tracking ON and then you can load the log text file in another PowerQuery and set some basic transformations on the file to get the specific query duration etc. ). And that’s all I can think of at the moment. Don’t forget , that you should reserve at least 500 MB for PowerPivot if you plan to load the data into the data model. If I come across any more recommendations, I will share them here, however combining these steps served me pretty well. I would like to talk here about SSRS reports personalisation. The point is, that there are situations, when you feel you could do a little more to ease the use in some specific reports. For example you have 20 additional columns and you can show or hide these columns based on what the user chose to see last time. Obviously this solution must also contain a parameter listing all the possible columns called ShowFields. Now we know, that SSRS 2008 lets you receive parameterized reports based on subscription to reports that run on demand. When you subscribe to a report that runs on a snapshot basis, your subscription must use the parameters values defined in the snapshot. But what if you cannot use subscriptions ? I came across 2 scenarios when report subscription was not possible. One was, that you had an browser based CRM / ERP type application which used embedded SSRS reports running from an Iframe in the app and the second was that you might have had an custom build container-browser for SSRS reports project. Personally I dont feel these options are that rare, as both mentioned were used at my last employer, and the second mentioned, the custom build container for SSRS reports was an front-end to a pretty robust financial Data Warehouse solution. So what will be the steps in this process? Let me guide you through the steps needed to accomplish this report personalization. Lets start with some DB back-end stuff. I remember when I was developing this solution, I prepared an report -level configuration table rpt.Report holding Report_ID INT set as identity column , ReportName, ReportDescription, IsActive flag and IsVisible flag ( for report listing in the application purposes – this way you could really quickly state that the report is under construction, is obsolete etc. ). The sky is the limit here. The second configuration table rpt.ReportColumn would be used for report column configuration holding ReportColumn_ID INT as Identity, Report_ID from the rpt.Report table, ReportColumnName, IsActive flag, IsVisible flag for country-specific purposes ( when a column might be never needed for users from some country in a multi-country enviroment ) and IsAdditional flag determining whether this column is an additional or a non-additional column. The next step might be a little bit time consuming as you must fill these tables with values , but you can come up with some clever string concatenation generating insert statements in Excel. 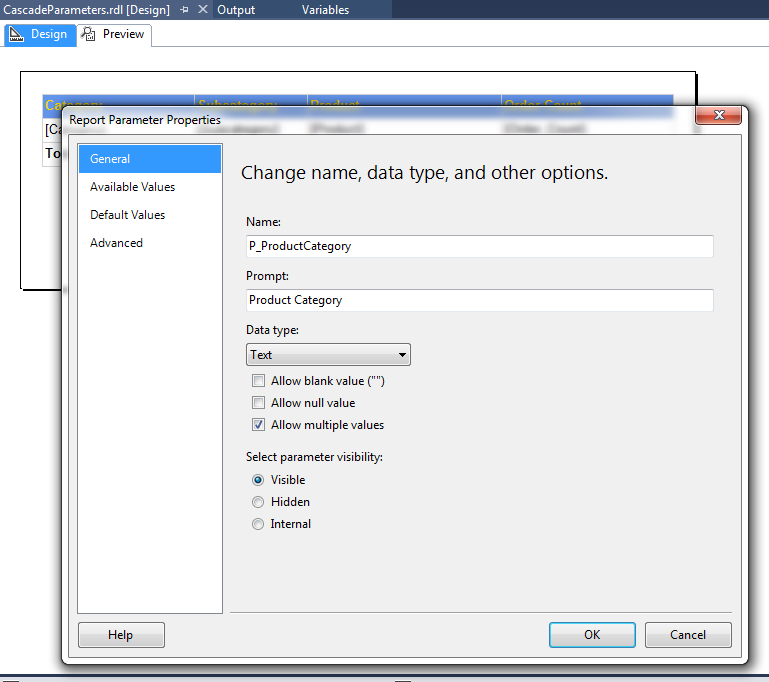 Now you need to create a table holding the report parameter cache. It must be a quick and a narrow one for some solid performance. I called mine rpt.ReportColumnParameterCache and it had just ReportColumnParameterCache_ID as an Identity column, ReportColumn_ID, and the Windows user login UserID named ReportUser NVARCHAR(100) column. MSDN describes UserID as The ID of the user running the report. If you are using Windows Authentication, this value is the domain account of the current user. The value is determined by the Reporting Services security extension, which can use Windows Authentication or custom authentication. And what are the next steps? We have to create a stored procedure ( lets name it rpt.ReportColumnParameterCache_DeleteInsert ) which has input parameters from SSRS report parameters UserID, ReportName (global variables) and ColumnNames ( ColumnNames would look like Column1,Column2,Column3 coming from the ShowFields report multi-valued parameter explained in the next paragraph) . Firstly this SP would delete your login-related cache for this report from the last time. I remember doing some basic measurements using time statistics and the scenario with deleting and inserting the cache rows was a little bit faster in my enviroment then any other option available. In the next step, this SP would transform the ReportName to the Report_ID from rpt.Report and then the ColumnNames into ReportColumn_IDs using a table value UDF and an inner join to the rpt.ReportColumn based on ReportColumnName and ReportName. Here are some examples how to implement a custom split-string function or in case you are lucky and already using MSSQL 2016, you can go with the internal SPLIT_STRING function. In the last step, this SP would insert these values into the rpt.ReportColumnParameterCache table. This SP has to be located at the end of the stored procedure used for retrieving the data into the report main dataset. 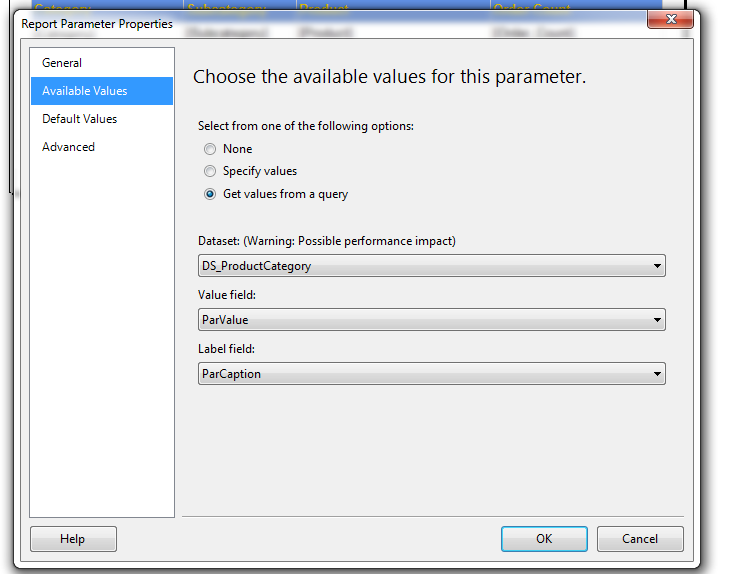 On the SSRS side, we need to create a report parameter holding multiple string values called ShowFields. This parameter should have available values fulfilled from a query showing available columns for this Report. The default values would be the values you have stored in your ReportColumnParameterCache table for your Windows login and this report, so in this case, it would be the result of a function containing a select, where the ReportUser value equals your Windows login (globals!UserID) and the ReportName (globals!ReportName) equals the value in the rpt.Report table.